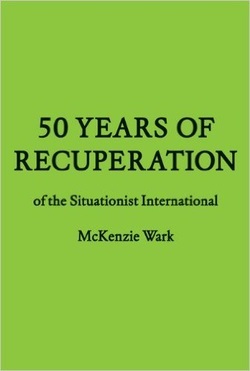 This fecund and generously illustrated little book about the Situationists by McKenzie Wark is an essential read for anyone who wants grasp the breadth and significance of their ideas and works. In less than 50 pages of text the book will steer you around two major obstacle/attractions: the mostly antipathetic reduction of Situationist thinking to the elegant texts of Guy Debord and the skewing of Situationist practice and theory of psychogeography in anglo-occult-literary writing. Instead, what you arrive at are the ‘knots’ of Asgar Jorn, a critique of deadly separations in scholarship, how to upscale détournement to social change, the shift in painting from an arrangement of materials to an arrangement of relations between people, how to apply the dérive to the archive, a strategic thinking more about lines of communication than territory, Constant’s dream world where “there would no longer be anything but differences” and Michèle Bernstein’s détournement of intimacy. While Wark would go on to develop these ideas and add much more to his variegated account of situationist practice in two later and longer books, the immediacy of the recuperation of marginalised ideas and actions here is demandingly and engagingly intense. If you want to use ideas from the Situationists – spectacle, dérive, psychogeography, détournement – then you need to read this book.